The TMNT have returned to New York City to investigate reports of a resurgence in street crime, allegedly being perpetrated by gangs of ninjas. 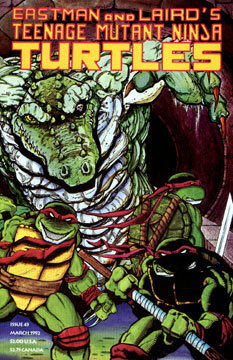 The issue opens with the Turtles defeating a group of Foot Soldiers who had ambushed them. Four of the Foot flee into the sewers and seek refuge in the lair that the TMNT had abandoned when they moved to Northampton, Massachusetts. The Clansters enter the Turtles’ old sanctuary only to be met by Leatherhead (from Tales of the TMNT #6), who has taken over the space. The gigantic gator quickly dispatches three of the four, but the last of the Foot talks Leatherhead into accepting them as allies. As it turns out, LH has been trying to build a Transmat for the past few years in order to teleport himself to the Utroms’ homeworld, where he feels that he can live in peace. Unfortunately for the mammoth mutant, his size prevents him from being able to do the fine work needed to build the device, so he needs the help of small hands to make his dreams come true. The ninjas think that Leatherhaed is insane, but fearing for their lives and desiring a powerful leader to take Shredder’s place, they do their best to help him. The work progresses quickly and Leatherhead leaves to fetch some equipment that he’s secreted away. While the gator’s gone, the TMNT return to their old lair and find the Foot Soldiers working on the Transmat. Just before a battle ensues, LH returns and defuses the situation. Leatherhead explains his plans to the Green Team and they agree to help him finish the device. Thus the odd team comprised of the Foot, Leatherhead and the Turtles work together to make a Transmat. Once everything is complete, LH climbs aboard the machine and bids his allies farewell. Donatello pushes the buttons that start the Transmat, but something goes wrong, and Leatherhead is merely singed by cosmic energy, rather than teleported to the Utroms’ homeworld. The failure is more than Leatherhead can handle, and he flips out, smashing Foot and Turtle alike in his rage – blaming both for trying to keep him trapped on Earth. As he’s smashing the place up, LH suddenly decides that killing his adversaries would be too easy. With this curse, LH flees the lair. Donatello tries to stop him, but Leo insists that Leatherhead needs time to be alone. Later, on the rooftops, the TMNT muse about Leatherhead’s fate. “Yes… we do.” concludes Leonardo.